It’s officially the beginning of 2018, and you know what that means: a new calendar, new resolutions (that you swear you will keep this time) and, if you are ahead of the game, new marketing strategies for your business. As the business environment gets increasingly more global, it also gets increasingly more complex and competitive. 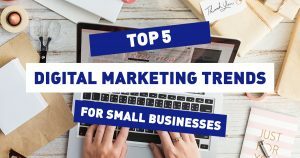 Many small business owners (SBOs) are brainstorming new marketing techniques and strategies to keep themselves ahead of the game coming into 2018. We have compiled the top trends from top business experts to familiarize yourself with as you and your small business tackle this new year. Optimizing all digital parts of your business for mobile use. Today’s society uses mobile phones as essentially an appendage of their body. People use their mobile devices to check their emails, order food, shop online, and check their various social media accounts multiple times a day. Experts from Small Business BC report that this year it is absolutely essential for your business to be optimized for mobile use on all digital platforms. Investing in social media marketing. Social media is the newest way SBOs are promoting their products, acquiring new customers, and building brand loyalty. According to in-depth research from Infusionsoft, around 71% of SBOs are planning to use Facebook as the main platform to acquire new customers, and 75% of SBOs are planning to use Facebook as a main component of their 2018 marketing strategy. Social media marketing is useful in increasing a business’ customer base and increasing brand recognition because the content is generally very creative and easy to consume. Gaining popularity this year will be the use of short, shareable videos and collaboration with influencers to promote products. Research done by experts at Entrepreneur states that the use of influencer marketing by companies has increased by four times in the last two years, and will continue to grow substantially in the next year. Of the marketers surveyed by Entrepreneur, 67% of them claimed that collaborating with influencers was beneficial for their respective companies. Influencer marketing is becoming increasingly popular because of influencers’ ability to target specific audiences, as well as serve as a more authentic voice, specifically on social media platforms such as Facebook and Instagram, than traditional advertising campaigns. Apple is doing it. Facebook is doing it. Amazon is doing it. All successful, influential companies are doing it. What, exactly? Making big investments into creating consistent, original content. Apple plans on investing up to $1 billion dollars into the creation of original content in the form of television series and video streaming in 2018, according to research collected by the Content Marketing Institute. The research also concludes that original content creation is a huge way for businesses to remain relevant and competitive. It also helps in growing and maintaining a loyal brand following. Using both macro and micro marketing techniques. Marketing is getting increasingly more competitive and more expensive. Thus, it is crucial for SBOs to target the right customers and to identify market segment needs as accurately as possible. To do this, SBOs need to utilize both macro and micro marketing techniques. According to experts from Forbes, most businesses are familiar with macro marketing techniques such as email blasts, paid advertising campaigns, and Facebook ad boosts. To take these to the next level, consider implementing micro marketing techniques such as splitting email lists into smaller, more specific categories, creating sales on specific items on your official website and promoting them to customers with related preferences, or specifying an age range, geographic location, and interests on your next Facebook ad boost. A place many SBOs fall short is analyzing the success their marketing techniques and figuring out what works and what doesn’t work well for their business. Investing time and resources into marketing plans that fall flat is frustrating and inefficient. Sources from Huffington Post encourage SBOs and their team to make an effort to utilize online tools such as Google Analytics and Facebook Insights to optimize reach and engagement on all marketing assets going in 2018.